Note: EGT cable lengths are now 6' - extension cables are available in any length. for great deals and service on all our products! Scroll down to the TE-104 sensor description for more info on the sensor. Our most popular unit - Hundreds sold! Same features as TE-107 except is packaged with a weld on - screw in probe and weld bung. See picture above except the TE-106 comes with a stainless steel weld boss and 1/8 pipe compression fitting. The dual mode infrared temp gun and EGT gauge kit saves money by combining two tools in one. It can be used as a Exhaust Gas Temperature unit or a infrared gun. Simply pull it off of the Velcro mounting in the car and point it at the item in question. Put it back in the car a moment later for EGT! It includes a laser sight, backlight, temp ranges of 0-750 for infrared and 0-2000 for exhaust, 1% accuracy. Included weld on exhaust probe with 72" kapton jacketed wire with Stainless over-braid. Tune your engine for maximum power and consistency and you can determine the temperature of tires, track, brake calipers, rotors, drums, cooling hoses, trailer wheel bearings, air conditioning output in the truck, stuff in the cooler - this list goes on and on. The instrument weighs 9 ounces. Note that our units include a laser sight and a very tight spot size cone which enables you to get the true temperature of an item (ie: the water pump housing without picking up cylinder head temp). Some economy temp guns are available without the sight making inaccurate readings more likely. Same as above except comes with a CLAMP ON probe See pic above except the TE-103 comes with a clamp on assembly. The 2 channel EGT unit offers MAX, for two cylinders. Included is 2 weld-on exhaust probes. The 2 channel EGT unit offers MAX, for two cylinders. Included is 2 clamp on exhaust probes. Tune your engine for consistency and power. IRT-2524 Dual mode infrared temp unit only. The dual mode infrared temp gun and exhaust temp gauge can be used as a Exhaust Gas Temperature unit or a infrared gun.You can determine the temperature of tires, track, brake calipers, rotors, drums, cooling hoses, trailer wheel bearings, air conditioning output in the truck, stuff in the cooler - this list goes on and on. It includes a laser sight, backlight, temp ranges of 0-750 for infrared and 0-2000 for exhaust, 1% accuracy. Invaluable around the race operation, shop, kitchen etc. Note that our units include a laser sight and a very tight spot size cone which enables you to get the true temperature of an item (ie: the water pump housing without picking up cylinder head temp). Some economy temp guns are available without the sight. Without the sight it is easy to get the temp of a nearby item. IRT-3400 Single channel temp unit only. The 1 channel EGT unit offers MAX, HOLD & RECALL for one cylinder or liquid temp sources. IRT-3401 Dual channel temp unit only. The 2 channel EGT unit offers MAX, HOLD & RECALL for two cylinders or liquid temp sources. NOTE - this unit will measure one channel at a time - we understand that is the case with all 2 channel units. This probe is a quick response exposed tip type with an Inconel 600 shell, a 72" Stainless Steel braided wire with a male K-type plug, and a brass compression fitting. Weld bungs in mild steel and stainless available below. These sensors are manufactured in the USA by the one of the premiere EGT manufacturers and are sensitive enough to see a single misfire at 8000 RPM! (of course you would need a data logger with a sample rate of 1000 per second to pick that up). All of our temperature sensors are ungrounded to eliminate RF interference. This probe is a quick response exposed tip type with an Inconel 600 shell, a 8' Stainless Steel braided wire with a male K-type plug. 1/8 pipe weld boss - stainless steel - less than most charge for mild steel! Add a compression fitting to the weld bung for a complete EGT fitting kit. 8 of the Stainless weld bung/boss. If you are trying to match some that you already have - a 7/16 fine thread nut fits on the threads. If you are trying to match some that you already have - a 3/8 coarse thread nut fits on the threads. Brass adapter ferrule 3/16 sensor to 1/4 Racepak header bung. Includes Nut. Racepak 1/4" fittings use 7/16-20 (fine threaD) male. 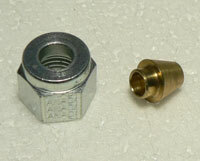 This adapter would typically be used to put 1/4" RP sensors in a set of headers with 1/8" female NPT bungs used by Computech, Edelbrock and others for 3/16" sensors.